The booklet points to various failures of the Modi government, the fatal collapse of the Achhe Din dream and how the common man was misled and taken for a ride by the "56-inch chest". Setting the campaign tone for the Lok Sabha elections, the Maharashtra Pradesh Congress Committee on Saturday released a booklet, “100 Mistakes of Modi”, highlighting what it alleged were the biggest blunders of the Bharatiya Janata Party (BJP) government led by Prime Minister Narendra Modi in five years. 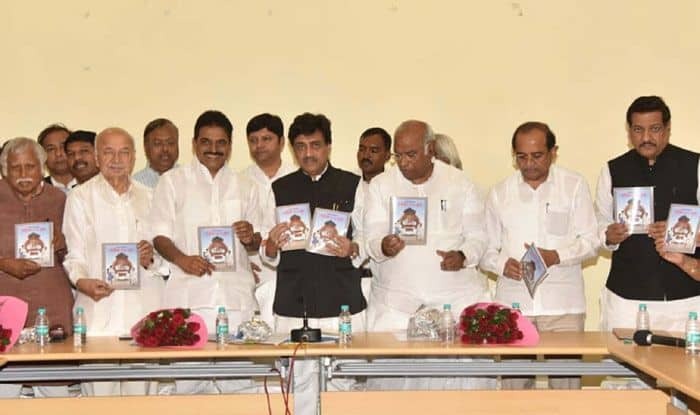 The booklet, published by the state Congress, was released by All India Congress Committee (AICC) General Secretary Mallikarjun Kharge in the presence of other top party leaders like KC Venugopal, Madhusudan Mistry, state Congress chief Ashok Chavan and leader of Opposition Radhakrishna Vikhe-Patil. The booklet points to various “failures” of the Modi government, the fatal collapse of the “Achhe Din” dream and how the common man was misled and taken “for a ride” by the “56-inch chest”. It dwells upon various topics, including large-scale unemployment and demonetisation, which the Congress termed as a “demon-itising” act on the people that neither reduced terrorism nor graft but claimed more than 100 lives, standing in queues. “The Indian economy, which survived the 2008 recession, is now on a deathbed. Under Prime Minister Manmohan Singh, the Congress had constructed a development plan, which was destroyed by the short-sightedness of the Modi government,” the booklet says. The major highlights of the booklet are controversial defence deals, the arbitrary goods and services tax (GST) and its messy implementation, and the Rs 5,000 crore spent on “fake advertising” in the first four years of the Modi government compared with just Rs 2,658 crore spent during the 10 years of United Progressive Alliance (UPA) rule. Despite the claims by the BJP-led Maharashtra government on a massive loan waiver package for farmers, the booklet says “it’s difficult to find a farmer” who has actually benefited from it. It further alleges in the name of crop insurance for farmers, the BJP gave a lottery to the insurance companies, which have looted thousands of crores of rupees, making it one of the biggest scandals. Taking potshots at the “Swachh Bharat Mission,” the booklet says filth is everywhere and the cleanliness mission, on which over Rs 14,000 crore has been spent, is only visible in the brooms held by Modi for photographs. On Ram temple, the Congress says it’s “a bluff and the aim is to provoke people” and it’s being discarded now because the BJP fears reprisals. Hitting out at the Mumbai-Ahmedabad bullet train project, the booklet says spending Rs 1 lakh crore on the project at a time when the Indian Railways is collapsing due to lack of funding is “unviable”. The booklet also lists other major blunders, ranging from farmers’ and women’s issues to healthcare, social media, banking sector woes and media surveillance.